Do you remember Gyro Gearloose? He was an anthropomorphic chicken created by the Walt Disney Company who appeared in the Scrooge McDuck comic-book series. Gyro was the town of Duckburg’s most famous inventor. Because his inventions were rarely successful, the name Gyro Gearloose has become synonymous with any inventor with a crazy or crackpot idea. 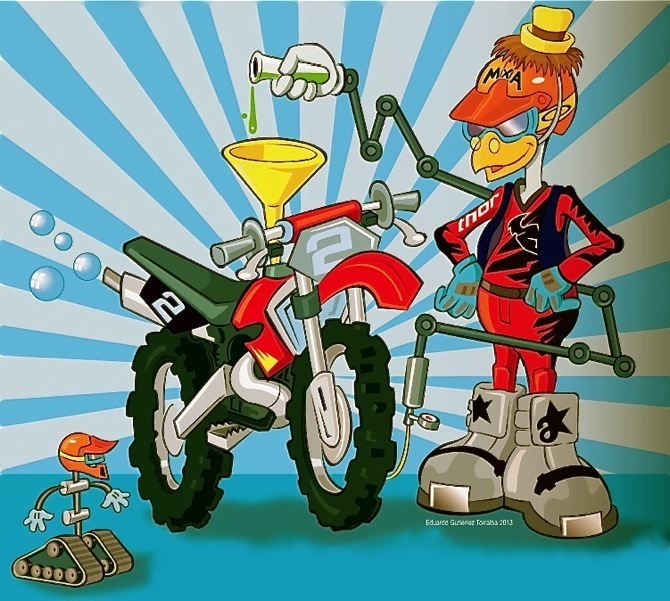 Motocross has had more than its fair share of Gyro Gearlooses — some amazingly successful and others forgotten. MXA presents the latest installment in its series of weird and wacky inventions. If you think aluminum motocross frames are new, you are sadly mistaken. Almost 60 years ago there was a motocross bike with an aluminum frame. The 1953 Greeves used a cast aluminum head tube and down tube in their Villiers-powered motocross bikes.They stuck with this basic design into the 1970s. The first, serious, all-aluminum, monocoque motocross bike was the British-built Hagon. It was raced by GP star t Vic Eastwood raced in 1977.Eastwood ran a Yamaha four-stroke engine, but you could buy Hagon frames to accept most four-strokes of the era. Yamaha TT500 and XT500 engines were the most popular. Hagon is still in business today—albeit the shock business. They make shocks for sidecars, offroad vehicles and speedway forks. The Yamaha YZM500 was the best known aluminum frames race bike. It also had the distinction of being the only water-cooled, Open class, two-stroke bike. The YZM500 was only raced for two years (1987 and 1988). The riders were Leif Perrson and Kurt Lundquist. There were also a coupled used for beach races. Only 8 complete YZM500s were ever made (6 in 1987 and 2 more for the 1988 season. In 1990, On The Line Line Racing imported Verona Racing Products (VRP) aluminum Honda framex from Italy. Initially they cost $6000 for the frame, but the eventual consumer price was $3500 (minus swingarm and subframe). A VRP swingarm was $550, the subframe $175 and aluminum gas tank $390. Given that this was seven years before Hond made their first aluminum frame — was was a bargain. In 1997 Honda released the Delta-Box CR250 frame. It was not a very good frame. In fact, Jeremy McGrath disliked it so much that it was one of the reasons he left Team Honda. It was too rigid, which transferred the load to the Showa suspension —which couldn’t handle it. However, the basic blueprint for future aluminum frames was set by this bike. ASK THE MXPERTS: IS THAT A BLACK MARK ON YOUR CAREER?